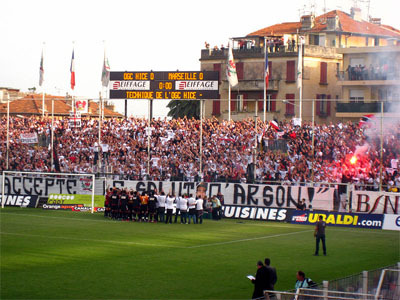 OGC Nice is one of the most successful football clubs in France with four national champion titles in addition to three Coupe de France victories. The OGC abbreviation stands for Olympique Gymnaste Club goes back to the start of the club when the club was named Gymnaste Club de Nice. Nice players and the fans in 1985. OGC Nice was one of the twenty original members of the French football ligue when is was established in 1932.